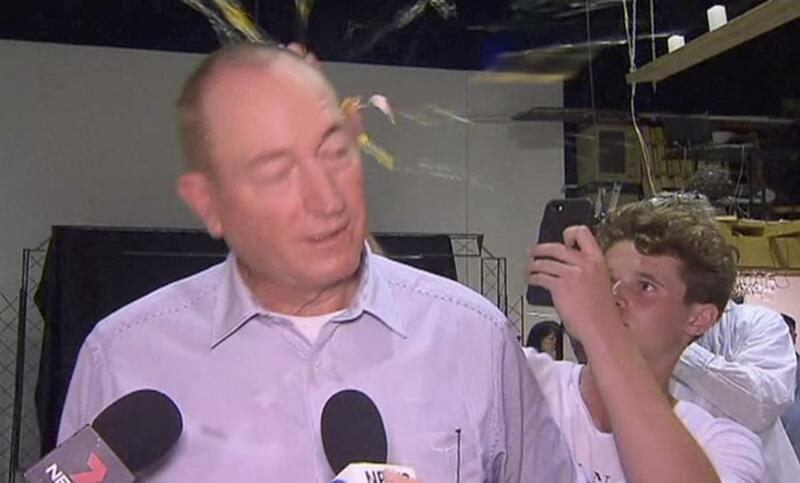 In this image made from video, a teenager breaks an egg on the head of Senator Fraser Anning while he holds a press conference in Melbourne, New Zealand. CANBERRA, Australia (AP) — An Australian teen known around the world as ‘‘Egg Boy’’ has conceded that egging a far-right senator was not the right thing to do, but says the gesture united a world reeling from a white-supremacist’s alleged massacre of 50 Muslims in New Zealand. Will Connolly gave his first television interview on Monday since becoming an online hero among many for cracking an egg on Sen. Fraser Anning’s head as the maverick legislator spoke at a news conference after a gunman killed or wounded 100 worshippers at two Christchurch mosques on March 15.